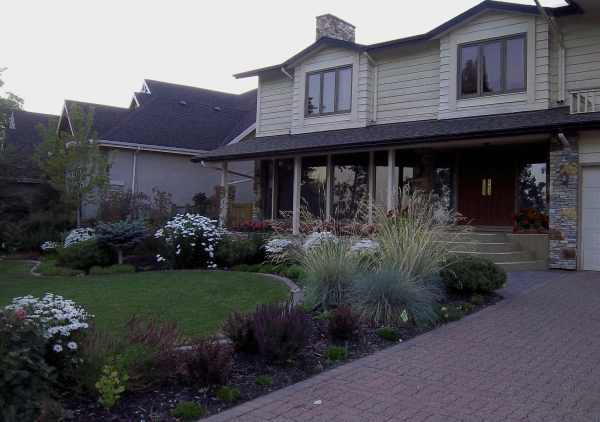 A good driveway landscaping photo can inspire you with curb appeal ideas for your own yard. A drive around your local area also helps by showing you the use of native materials and plants. 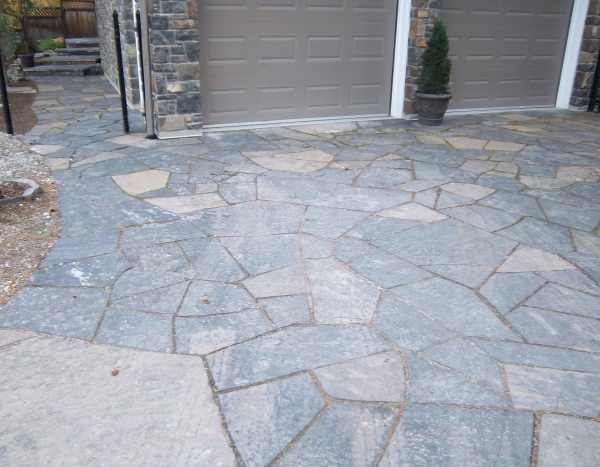 Driveway ideas like this flagstone path style, are a great way to add character to your front yard. This would make me feel like I was arriving at a cottage when I came home. What a great way to mentally shift gears from work to play. 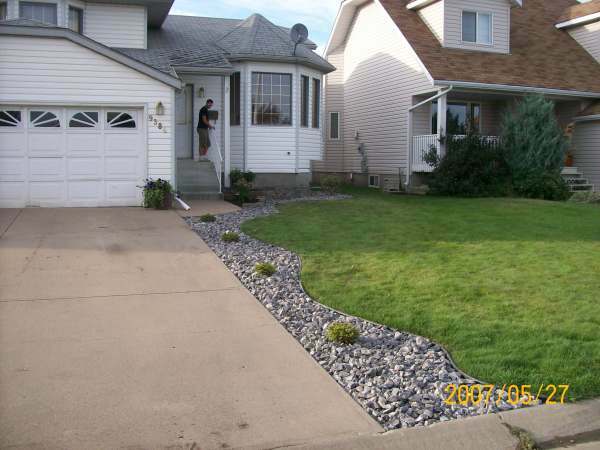 Landscaping driveways is one of the most challenging things to do in your yard. Front yard curb appeal is important because of the visual exposure to the public, but it also has to be practical for vehicles and foot traffic. In northern climates, it will have to resist the stresses of heavy snow, ice, and salt. Other times it has to endure extreme desert heat or drought. Visual appeal doesn't always have to be sacrificed for being practical. 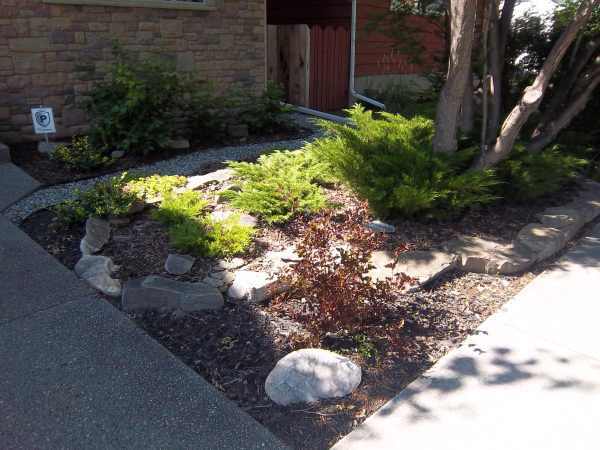 Driveway edging using decorative rocks and hearty shrubs has become an attractive and popular way to deal with winterkill of grass. 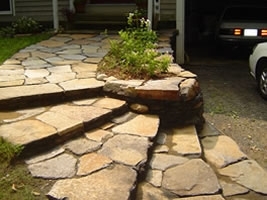 There are many other creative ways to landscape your front yard using a variety of different materials. For Pinterest users, we have added pin-it buttons for each picture to make it easier for you to share with other users. You can also follow us on Pinterest as we have over 7000 categorized landscaping pictures on over 70 different boards. 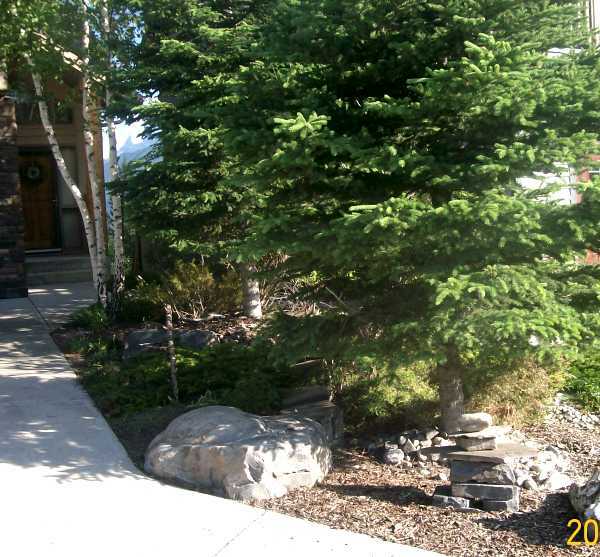 Click on any driveway landscaping photo to open a gallery slideshow. placed to accent the rocks and trees. 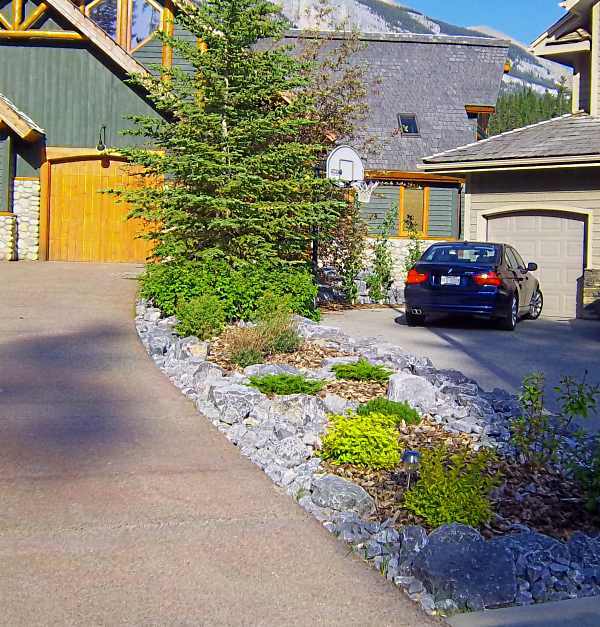 Driveway landscaping between two neighbors with a small slope can be challenging. 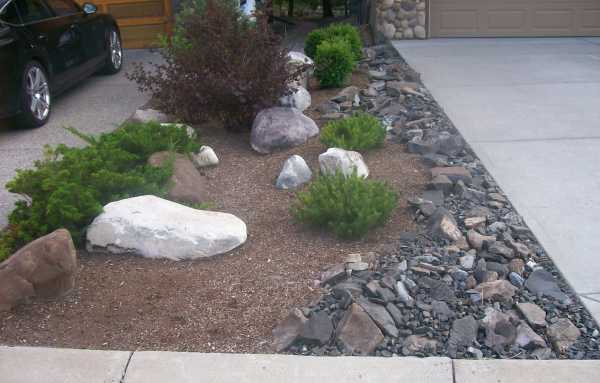 Instead of building a small retaining wall and separating the properties, try simple rock garden ideas like this. retaining the rock from spilling onto the sidewalk. Picture permission of a homeowner with a dream yard. 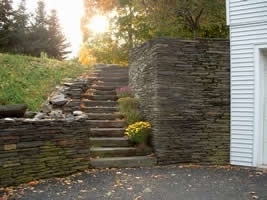 The stone walls and interlocking brick driveway used here are a great way to blend a design into the existing natural landscape. There is no mowing or watering involved when using natural trees and shrubs. provides elegance and safety at night. in the front of the evergreens. 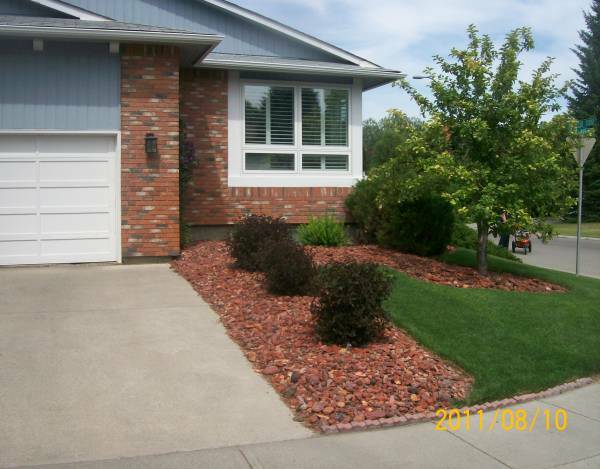 A mixed ornamental grass and perennial garden wrap this front lawn for some great color and front yard curb appeal. The driveway edging and garden edging are done using the same brick. 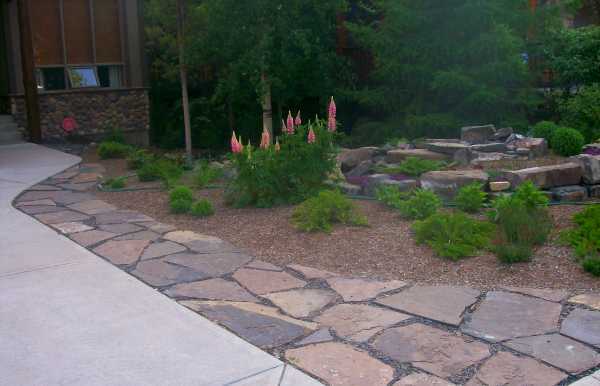 Driveway landscaping with flagstone providing a walkway that doubles as a border to a low maintenance front yard. It also provides a great transition of colour to the stonework in the house, and the rest of the yard. 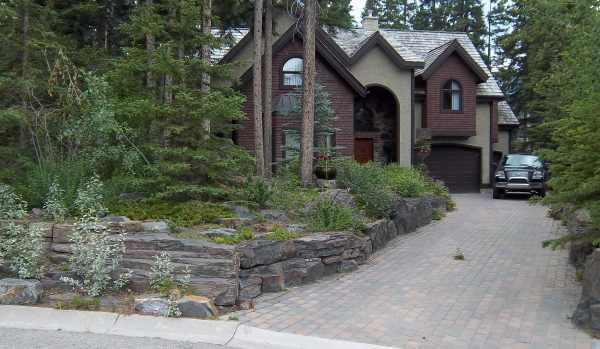 With the driveway lower than the front door, this retaining wall and flagstone front walkway were a nice addition. It is also complimented with a small garden bed between the walkway and the wall for added colour and interest. of the walls and pillars of this garage. Winterkill in northern climates from snow, ice and salt down the edge of a driveway can be a losing battle. 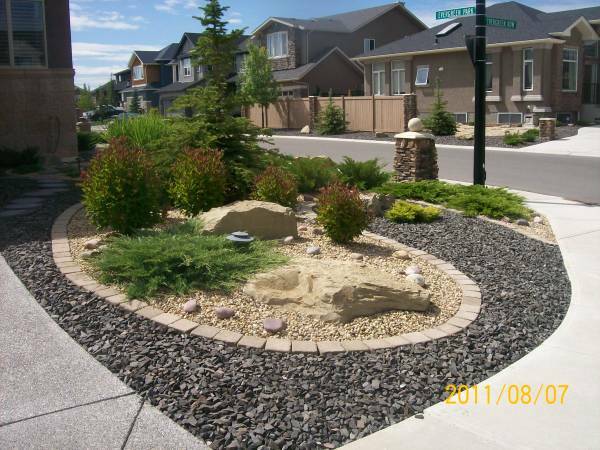 Installing edging and rock or mulch beds has become a very popular and effective way to deal with this issue. 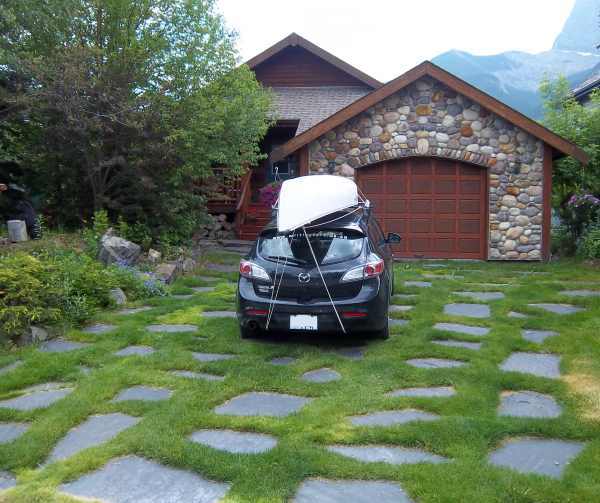 These two neighbours built a creative low maintenance space between the driveways. They did it by not using a defined property line. They each used their unique and individual ideas and blended it into one fluid design. 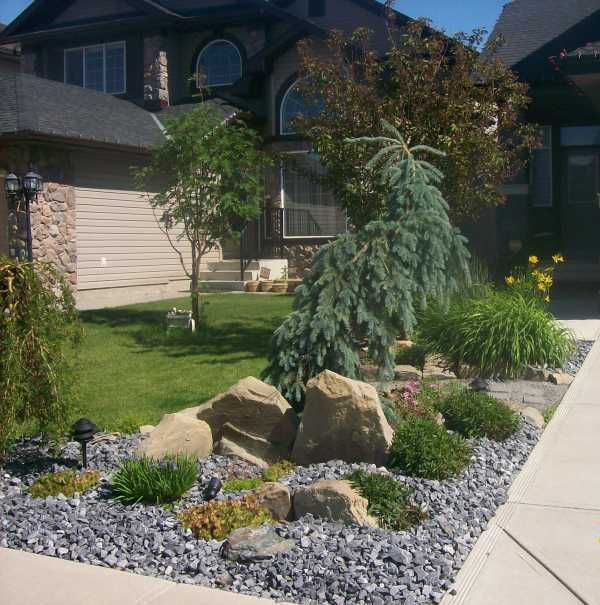 Small front yard landscaping made simple. 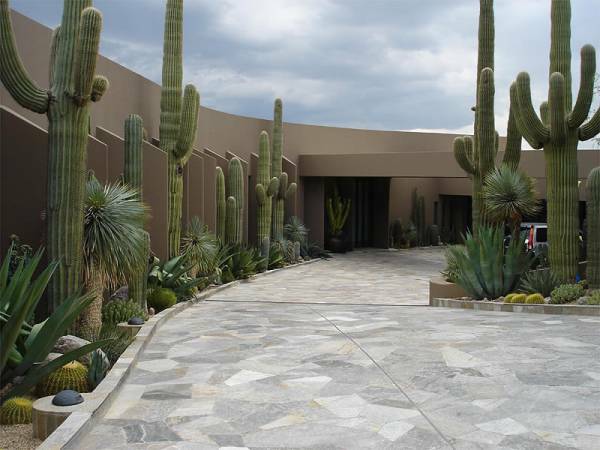 This attractive exposed aggregate driveway with a simple rock garden will require almost no maintenance. A small dry creek bed has been added for drainage from the side of the house.